http://www.line-stickers.com/ – Cinnamoroll Line Sticker | Sanrio’s soft & fluffy character, Cinnamoroll is here on LINE! Trust Cinnamoroll’s cute & innocent expressions to make you even closer to that special someone. Cinnamon is the white dog who was born on top of snow. Chuckle along to this pleasant collection of Cinnamon stickers. 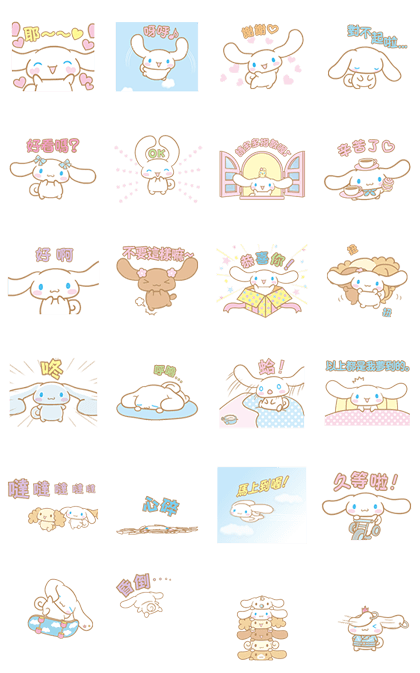 Cinnamoroll brings you this cute and slightly eccentric set of animated stickers. Spice up your chats with a bit of Cinnamoroll’s gooey goodness!